The conversation surrounding smart cards on campus is one that is met with reticence by some, but the reality is that universities in other countries have been leveraging smart cards for decades. It’s rare to see these programs in action, though, as the divide between both smart card opinion and geographical distance is often too great. In an effort to better understand how universities abroad are handling the campus card, the University of Cantabria, in Santander, Spain, shared its story. The University of Cantabria is one of the most advanced smart card implementations in higher education, using both contact and contactless technology to facilitate virtually every campus card service. Founded in 1972, the university is located in Santander, Spain, and has been a 15-year flagship for Santander Bank. Together they have built a campus card scheme used by universities across the continent and the globe. The university maintains two campuses with more than 13,000 students and 1,400 faculty and staff – each outfitted with a university smart card. Sharing a city with Santander Bank has had its advantages for Cantabria, and the university has provided the ideal proving ground for the bank’s higher ed division, Santander Universities. Santander Universities issues smart cards to 302 universities in 12 countries, according to Prior. The program is supported by five university research centers, the first of which was established in Cantabria in 2000. “Cantabria played a key role in communicating our collaboration to other universities, first in Spain and later in Portugal, the UK, Latin America, the U.S. and China,” says Prior. Smart card services include access control, library patron ID, discounts at shops and, optionally debit, explains Prior. “Over time, universities have the choice to incorporate value-added services, such as digital signature and payments at public transit, or even use our university mobile app,” he adds. Cantabria’s smart card facilitates a full range of on- and off-campus services, with both contact and contactless options for all of the above functions. European countries have been working with smart cards for nearly three decades. In fact, Cantabria has never used magnetic stripe, implementing chip cards as far back as 1995. 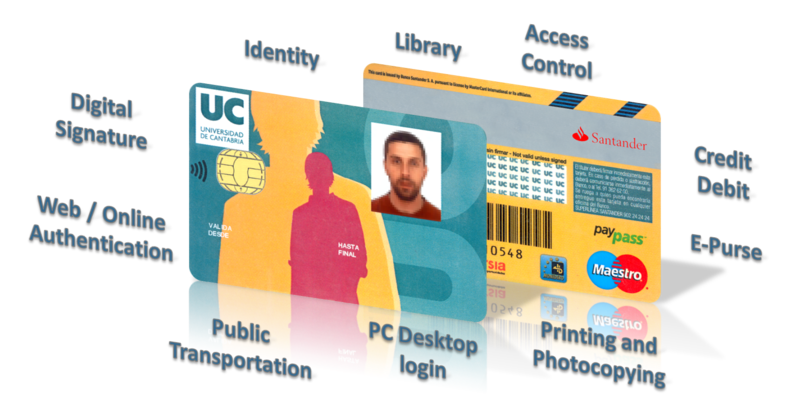 “The smart card better suits our requirements for secure offline and online services,” says Jorge Lanza, assistant professor and director of the University Smart Card Technological Research Centre at University of Cantabria. Cantabria’s smart card facilitates a full range of on- and off-campus services, with both contact and contactless options for all of the above functions. Lanza hails the university for practicing a “do it yourself” method of deployment, rather than relying solely on external solutions. “We require open interfaces in order to be able to fine tune the services we provide so we can learn, implement, test and deploy them ourselves,” he adds. The services supported by Cantabria’s smart card include library, access control, mobile apps, debit, ePurse (declining balance), print/copy, public transit, PC desktop login, online authentication and digital signature. These services are available using both contact and contactless technology. Added value for students also comes in the form of EMV compatibility, which makes the Cantabria smart card a viable solution for both on and off-campus transactions. The university and the city of Santander’s public transit body use the same contactless technology, so using the student card for transit access is another popular option. For a university that is already working with an advanced smart card system, it’s hard to posit what the next step could be. As with other universities, however, Cantabria has its eye on the mobile device. The idea of a mobile credential is also in the cards for Cantabria, and Lanza is keen to leverage another of the smart card’s capabilities to add the service. “Our smart card is completely NFC compatible so that we can also use it in combination with our mobile phones,” says Lanza, adding that physical access via a mobile device is close at hand for the university. The idea behind Santander Universities is to promote the idea of a cooperative network between their campus clients. “Now, getting the full set of services takes much less time – often less than 12 months – for a new university than it did for Cantabria, which has been a pioneer over the 20 years that we have been issuing their card,” adds Prior. The work being done at Cantabria serves as a beacon for others in the Santander network … and vice versa. The ultimate goal is to enhance each university’s smart card ecosystem, based on the shared experience of the entire network.